It has long been known that in the world of marketing, content is king. There is no other single factor that has more importance in attracting interest and driving leads through your sales funnel. 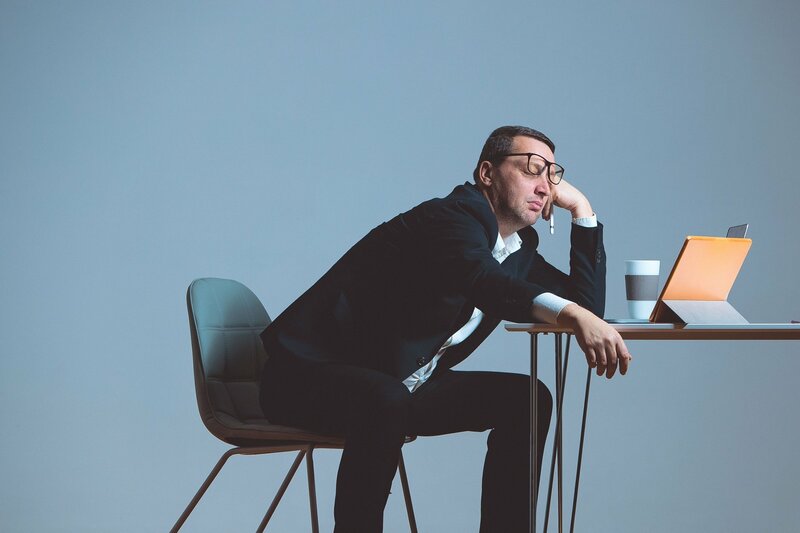 However, many organizations lack a cohesive and unified strategy when it comes to developing and maintaining their content, leading to inefficiencies and lost sales. Subpar content and a poor user experience (UX) drive traffic away rather than successfully converting it. Performing regular content audits helps you identify the underperforming content on your website and fix it before it affect your website UX and damages your sales funnel. By using the findings of your content audit strategically, you can boost your engagement and conversion rates and provide a superior customer experience. 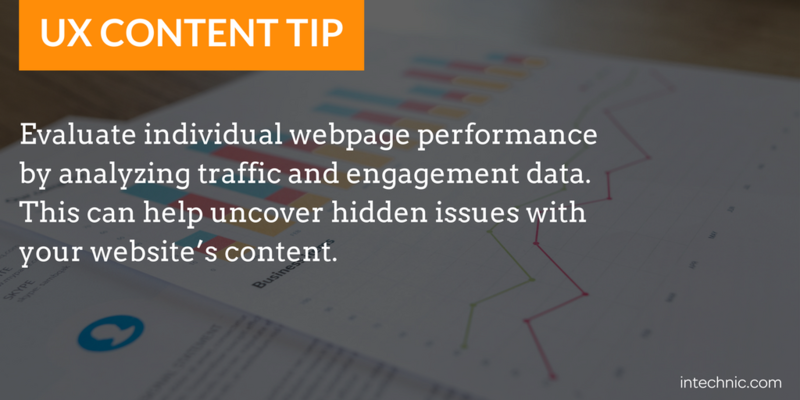 Conducting regular content audits can help you identify the underperforming parts of your website. A content audit is essentially a thorough review of all pages on a website, with a focus on collecting information about how each individual piece of content specifically fits into the customer journey, who the intended audiences are, whether or not the content is on message, and other critical data. Why Should You Perform a Content Audit? Content audits are performed in order to provide you with the information necessary to make the right strategic choices regarding the development of content for your site’s sales funnel – which pages are performing well, which pages require further development, and which pages should be pruned or consolidated with others, to name just a few. Content audits will also help you identify the areas of your customer journey and user experience that need further attention and refinement or may be off-message. A few months after executing the audit and making the proper adjustments to your content and UX, you should see a marked difference in engagement and conversion rates. Audits also help you more effectively manage your investment in content creation by preventing the duplication of work and helping to promote a unified voice across all content used in your sales funnel. Content audits help you make the right strategic choices about your content's performance and the need for new content. Who Should Perform the Content Audit? If you are the project manager of your website redesign or responsible for your website’s content, you should be the one performing content audits. There is no third-party agency that is going to know your industry, your products, and your unique selling propositions better than you do. While your organization may need help crafting new and updated content to serve your strategic goals, the actual analysis portion of the audit should always be kept in-house. 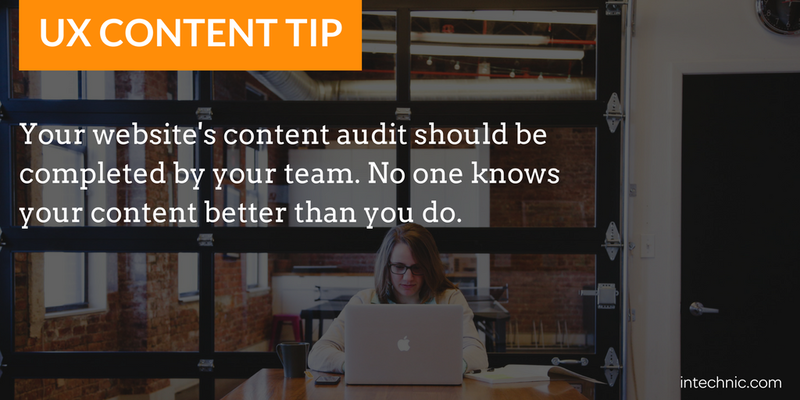 This isn’t to say that your content auditor should be the only person contributing to or overseeing the process. Once, after one of our clients had performed an audit, we were brought in to review the work. We quickly discovered that a junior member of their marketing team had been assigned the auditing project and, as a result, much of the content was skewed toward their rather limited view of the business and their clientele. Soliciting feedback from groups of colleagues in other areas of the business, or even from customers themselves can help provide a more comprehensive view of your content and foster organizational support for the process, along with helping to speed things up considerably. How Often Should You Audit Your Content? Always remember that, ultimately, your website is just a content presentation tool. 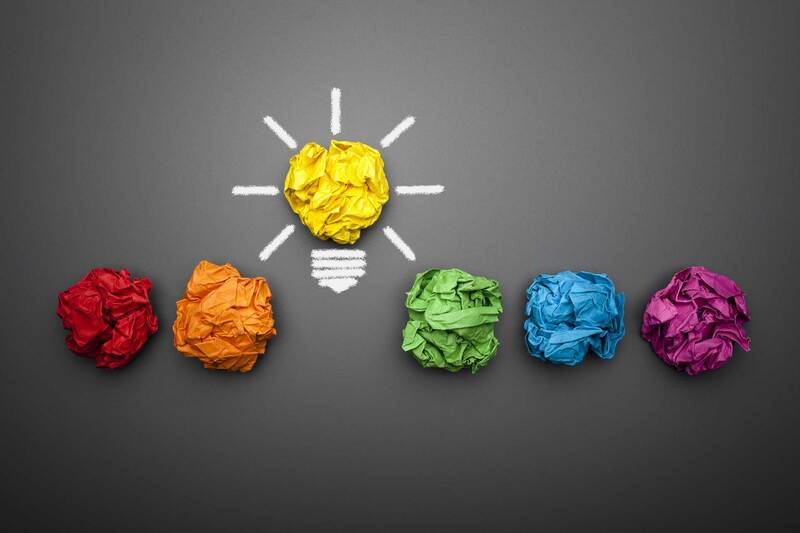 Keeping your presentation fresh and impactful requires an ongoing commitment over time. Although there is no hard and fast rule when it comes to how often you should perform a content audit, aiming for quarterly execution is a good target for most organizations. Performing audits at this interval ensures you have access to fresh baseline performance metrics, makes your data significantly easier to manage and interpret, and helps you stay in line with industry trends. The important rule of thumb for frequency is that conducting audits should never be a one and done process. We once dealt with a client who came to us wondering why their content was underperforming in terms of conversions. One of our first questions to them was whether they had ever performed a content audit. It turns out that they had – once, almost five years ago. As a result, the user experience of their website was subpar. Their outdated, poor quality content had made them woefully out of sync with industry and customer trends. It is vitally important that you have already constructed accurate buyer personas and thoroughly mapped out their various purchasing customer journeys prior to beginning your content audit. This is because one of the primary purposes of the audit is to re-focus your content on the needs of your audience. Every piece of content you invest in creating and promoting should directly correlate with both a specific target audience, and a specific purpose or CTA. A thorough content audit consists of two major steps. First, a content inventory is performed to identify and locate every piece of existing site content. Secondly, the content audit itself is performed to assess your content’s relevance, performance, and adherence to your overall content strategy. ID Number – You’ll want some sort of unique identifier for each piece of content to aid in the process of reviewing and iteration. Page Title – Your page titles should not only grab the attention of visitors, but should also be updated to follow all current best practices for SEO. URL – Review how your website has assigned URLs to your current content, and consider updating them to comply with SEO best practices to be descriptive for viewers. Level within Site Navigation – It is important to show the basic hierarchical relationship between various content items and pages to develop a more complete picture of how traffic flows through your website. Content Type – Static web pages have different requirements and purposes than blog posts, which are different from news stories or links, etc. Categorizing each piece of content by type allows you to more effectively evaluate whether it is fulfilling its purpose. Character Count – While all of your content should follow SEO best practices, which include stipulations on minimum page/article length, you may also find that your user base responds more or less favorably to differently formatted content. Some industries may be better served by longer format content, like case studies and white papers, while others may realize superior engagement rates with simpler, shorter, and easier-to-digest content. Tracking character count and comparing it to engagement rates can help answer this question for your business. Author/Maintainer – Noting the original author of the content will give anyone looking to improve or expand on the content in the future an initial point of contact and reference; it also gives a layer of accountability to the process that can help ensure accuracy in messaging. Topics/Keywords/Metadata – Topics, tags, keywords, alt attributes on images, and all other pertinent metadata should be noted for each piece of content to verify that they are both properly optimized for SEO, as well as organized in a fashion that helps enhance the user experience. Last Updated – Both search engines and website users appreciate it when content is kept up to date and accurate. Tracking content changes by date will help you identify the pages which haven’t been touched in a while and could potentially use some attention. Track content changes by date so you can more easily identify which pages have not been touched for a while and need updating. Broken Links – Broken links within your content are one of the worst possible disruptions to your UX; each and every link on every page should be manually verified during a content audit. Purpose – Every piece of content should have a specific purpose within your customer journey; people’s time and attention span are extremely limited, and presenting them with superfluous or trivial information negatively impacts your user experience. Get them in, and give them what they need – quickly. Accuracy – Great care should be taken that all your content is 100% accurate. Avoid the use of misleading or unclear language on your website, and provide supporting information and data to back up any statements of opinion you make. Design - Is your content designed to create a superior user experience? Consider the readability of the content. Does the text layout allow users to scan and find information easily? Also evaluate your color choices – some combinations can make your content easier or more difficult to read. Intended Audiences (Personas and Customer Journeys) – Different subsections of your customer base may require different methods to generate initial interest and follow through. 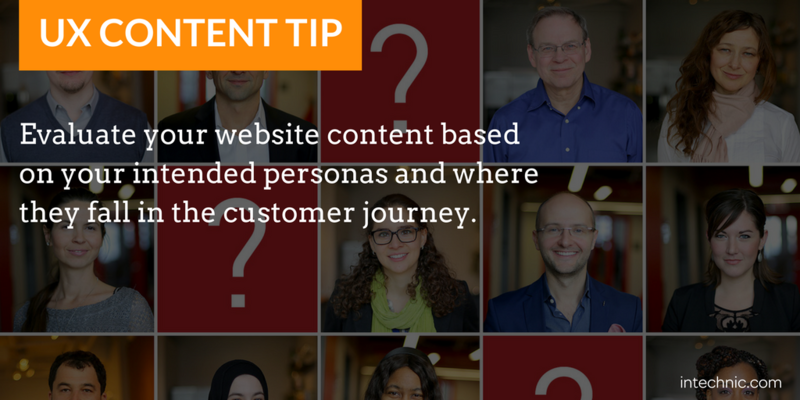 Tie each piece of content to one of your specific buyer personas and journeys to properly evaluate it in that context. Consistency with Brand Style Guidelines – Maintaining a consistent voice and style across all of your brands’ content helps manage audience perceptions, protects the investment you’ve made in building your brand, eliminates potential brand/product confusion, and helps properly convey your outlook and attitude to potential customers. Is It on Message? – Your content should not only attract interest and engage readers, but also clearly communicate your unique selling propositions and calls-to-action. Off-message content produces lower engagement and conversion rates. Keep your users engaged by clearly communicating your message. Irrelevant information lowers user engagement. Prune ROT (Redundant, Outdated, or Trivial Content) – Content that does not directly appeal to established buyer personas in a purposeful and on-point manner should be pruned from your website entirely. Traffic/Engagement Data – Problems with individual page performance, people bouncing off your pages too quickly, or staying on one page overly long because they cannot find what they are looking for, are two examples of this issue. This problem can be identified through analysis of your traffic and engagement data. Call-to-Action Performance – Most organizations are engaged in a constant cycle of A/B testing to tweak and improve their calls-to-action (CTAs). Note which variants perform better than alternatives over time, and update your content to incorporate your latest insights. OUCH Method (Outdated, Unnecessary, Current, Have to Write) – The OUCH method helps you track the value and status of content as you engage in the audit and redevelopment process. Update outdated and inaccurate content, cut unnecessary information entirely, keep track of which pages are currently in good standing, and plan ahead by noting content or pages that should be developed in the future. Utilize Built-in CMS Functions – Many websites use a content managment system to help authors manage and publish their content and pages. Most high-quality CMS software has tools which can help speed up the auditing process by automatically pulling data for the inventory. Prune Unnecessary Information – Every piece of information featured on your site should both appeal to a specific segment of your audience and be relevant to a part of their decision-making process. Don’t be afraid to prune extraneous information; doing so will dramatically improve the user experience of your site for visitors. Let Function Dictate Form – Don’t be overly concerned about imposing a navigational structure on your site from the top down. Instead, worry about getting the content just right to best appeal to your target audience. A natural, organic way of organizing the experience should reveal itself in due course. 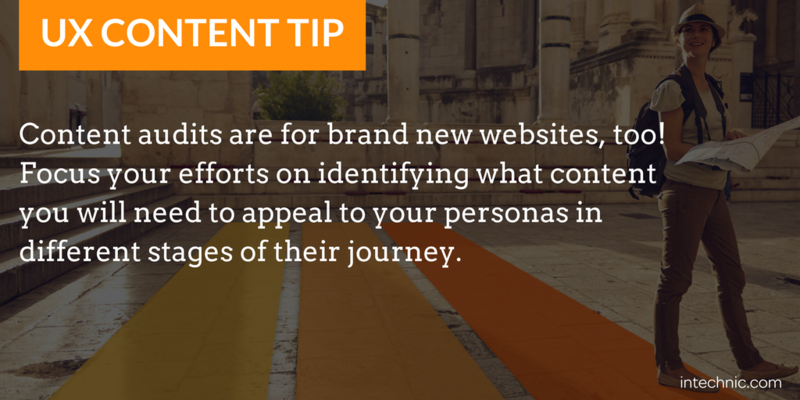 Focus on your content’s message and not where it lies in the navigation structure. You will have time later to revisit and organize it. 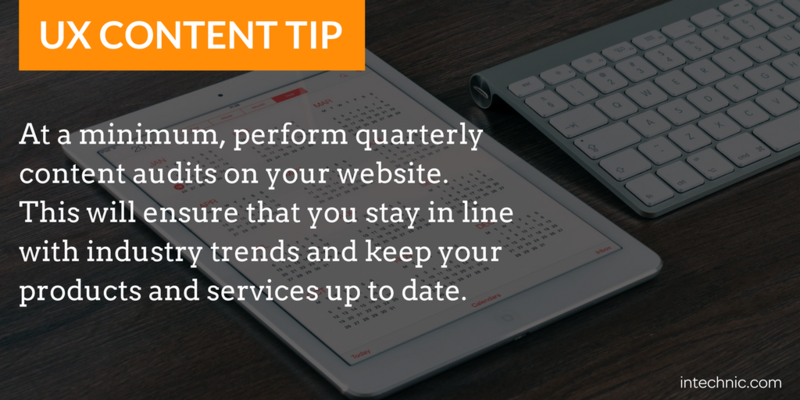 Be Prepared to Invest Some Time – Many site owners dramatically underestimate the amount of time a solid content audit takes to perform. They imagine it may be a matter of an hour or two, when in reality it may take several days or more, especially if your site is large or has a more complex series of buyers’ journeys to accommodate. Never Cut Corners – Continuing from the previous point, try to resist the temptation to cut any corners during the audit process. Avoid skipping sections or skimming content rather than analyzing it in-depth. Small, basic mistakes made during the auditing process can lead to erroneous strategic decisions further down the line, which can potentially have severe negative repercussions. Audits Are Valuable Even for Brand New Sites – Believe it or not, the auditing process can also be successfully employed even for brand new websites that have no content. Doing audits at this stage can potentially help you save significant development costs down the line, and ensure your initial infrastructure is built properly rather than having to make expensive and time-consuming changes in the future. The only difference is that rather than beginning the process with an inventory of existing content, you instead focus on the resources you’ll be using and the potential needs of your buyer personas at different stages of the customer journey. Extremely Large Sites Are Not a Problem – Even if it isn’t feasible to directly analyze every page of the site (as may be the case for the largest or most complex sites, with 5k+ pages to deal with), there are still benefits to conducting a content audit. Even the very largest sites will still have content grouped according to purpose and classification. These groups can be reviewed with an eye towards deriving a new taxonomy for your data organization to improve navigation and UX while cutting development costs. Engagement rates across broad groups of content can also be studied, helping you identify which types of content are performing acceptably in terms of engagement rates, and which of your major templates could use some additional review. Optimize Current Content Before Creating New Content – Oftentimes, organizations get hung up on the idea of constantly creating new content – despite having a huge library of still functional copy that could easily be trimmed or tweaked to continue performing. While the addition of new content is of course important, don’t forget that you have already invested in creating your current content – and fixing things up a bit often requires significantly less time and resources than starting from scratch. To truly leverage the power of your content audit, remember to treat it as a step in an ongoing process, rather than a one-off activity. Your first content audit will provide you with reams of data, along with direction as to which specific pieces of content on your website should be changed and why. Implementing these changes should result in a noticeable and measurable boost in your website's performance. However, there is still much work to be done. After you have completed your first audit and adjusted your content strategy accordingly, you’ll want to go all the way back to the beginning of the process and start again. Re-evaluate your buyer personas if necessary, and try to refine and improve the quality, consistency, and clarity of your message with every new version of content you produce. Treating auditing as an ongoing process also helps ensure that your messaging stays relevant over time; the content needs of a startup are quite different from those of an established company. Also, business goals and target demographics mature and change in response to market conditions. Sometimes, entirely new products are developed, or markets face disruption from internal or external factors. Regardless of what specific circumstances may be in the future, the only thing that is constant is change. 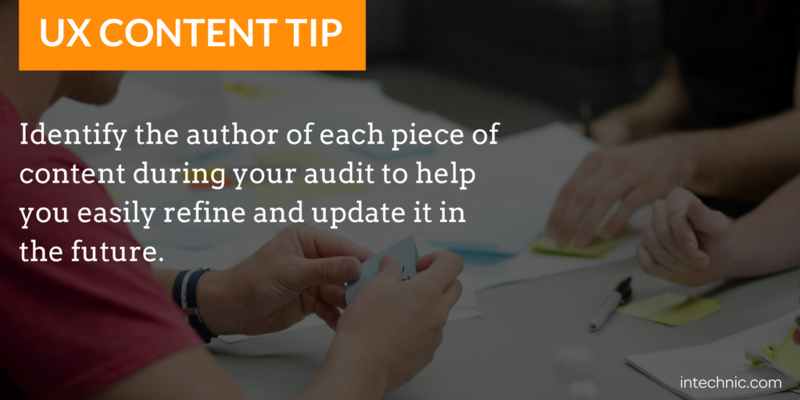 Treat content audits as an ongoing process. Business goals and target demographics change over time and you should respond accordingly. Content audits are one of the most important tools available to those seeking to understand how their websites actually function on a nuts and bolts level. Few other methods allow you to analyze your targeted buyer personas, customer journeys, user experience, and sales funnel so thoroughly with real, performance-based traffic and engagement data. 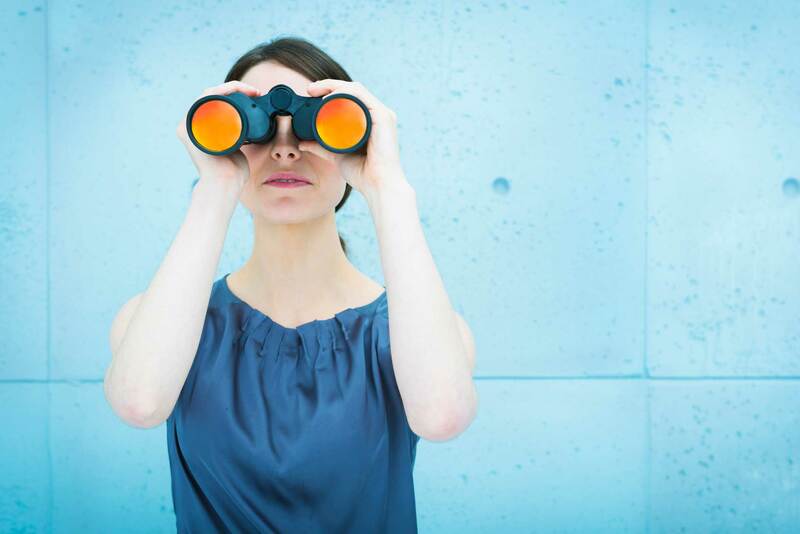 The ongoing commitment to continuous content auditing may seem overwhelming at first, and the process certainly isn’t easy, but the fact is that it delivers results, and organizations that engage in this practice will outperform those who do not. If you find yourself in need of assistance with any part of your content audit, contact the team of UX experts at Intechnic today, and let us help guide you through the process.